Merry Christmas to all! 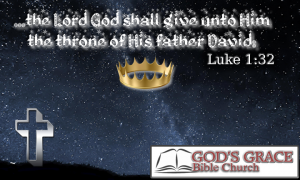 The Church family of God’s Grace Bible Church wishes all a joyous Christmas and a Happy New Year! The Incarnation of Jesus Christ serves as the foundation for belief. Without the birth of a pure, spotless “God-Man,” there could not be a crucifixion to pay for the sins of the world! We will celebrate the birth of Jesus through special music and a special message, on Sunday, December 17th… 10:00 AM, followed by dinner, and a Yankee Swap. Be sure to join us!